A family feud at a New England grocery might have made a dent in national employment numbers, the Bureau of Labor Statistics said Friday. 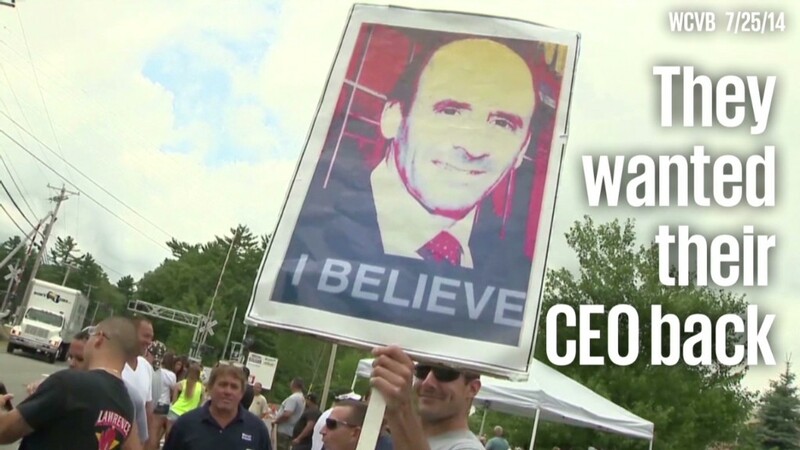 Workers at Massachusetts-based Market Basket went on strike and inspired a customer boycott last month after beloved CEO Arthur T. Demoulas got fired following a feud with his cousin, Arthur S. Demoulas. The Bureau of Labor Statistics mentioned that the food and beverage retail category lost 17,100 jobs between July and August, attributing some of the dip to "a grocery chain in New England." That's a slight dip for a 3 million-strong employment category that hasn't seen so many workers in 14 years. Related: Workers thought they'd lose their generous benefits under Arthur S.
Arthur T. got back his job and control of the company last week after he and a group of investors bought out Arthur S.'s 50.5% stake for more than $1.5 billion. While they hashed things out, store shelves sat empty and many part-time workers saw their hours cut. But the number of workers who actually went on strike may have been a small fraction of the company's estimated 25,000 employees. The BLS' August 2014 strike report, which tracks how strikes of more than 1,000 workers affect jobs numbers, doesn't list any activity last month. The Federal Mediation and Conciliation Service, which breaks out work stoppages smaller than that, hasn't yet posted its August 2014 report online. And it's hard to say just how strong of an impact the strike made on food and beverage jobs nationwide. The BLS is cagey about releasing too many details about how it figures out how much any one event affects a specific category. It wouldn't even confirm that Market Basket is the New England grocery chain in question. "There's just too much churn within industries to associate it with the entire change within one month or one report," said Mike McCall, an employment economist with its national office. Gary Steinberg, a BLS spokesperson, said the BLS often makes note of unusual events like weather and strikes that affect sizable businesses or drum up significant interest. The closure this month of several Atlantic City, New Jersey casinos will likely show up in September's report, he said. Further, the strike's effects might not even be that long-lasting: Consultancy firm IHS Global Insight said in a report that it expects 30,000 more jobs to show up in the food and beverage retail category next month now that everything's been settled at the grocer. Doug Handler, the firm's chief US economist, said it's hard to say how many of Market Basket's employees stopped receiving paychecks or if there were any ripple effects in other parts of the industry. But he didn't think the situation would be a big deal going forward. "We do consider the Market Basket situation to be a blip," he said. Overall, the economy added 142,000 jobs during the month, dropping the unemployment rate to 6.1% but falling short the 226,000 jobs expected from economists CNNMoney surveyed.